LILONGWE – As the Zimbabwe unrest reaches unprecedented levels, the country’s neighbours are feeling the economic pinch with some businesses starting to close shop. The Economics Association of Malawi (Ecama) says the Zimbabwe unrest could trigger scarcity of some imported commodities, resulting in increased prices due to high transportation costs, The Nation reported. 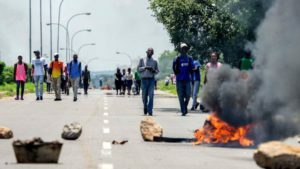 The development comes as Malawian traders using road transport through Zimbabwe to and from South Africa are unable to proceed as protestors of the Zimbabwe fuel hike reportedly blocked roads. As a result many transporters, mostly buses and trucks, have cancelled their trips. Ecama president Chikumbutso Kalilombe told the daily that the country is feeling the effect because Zimbabwe is one of Malawi’s major trading partners and that Malawian cross-border traders mostly use the Zimbabwe route because it is direct and cost-effective. He said apart from high transport costs, the unrest has resulted in restrictions of goods and services that pass through; there are changes in road taxes and it takes more days for the transporters to deliver the goods. Cross-Border Traders Association president Esther Tchukambiri told the paper that businesses are losing out as they cannot travel to Zimbabwe and through to South Africa where they buy most of their goods. South Africa has also said the situation in Zimbabwe is not good for South African businesses.